We’re all different people coming to situations with different perspectives. We all have something to offer a situation and a good leader understands that. A good leader can listen to everyone that comes across their path and distill order out of chaos. But before they can make sense of anything, they must do just that: listen. Listening isn’t something to be done passively. 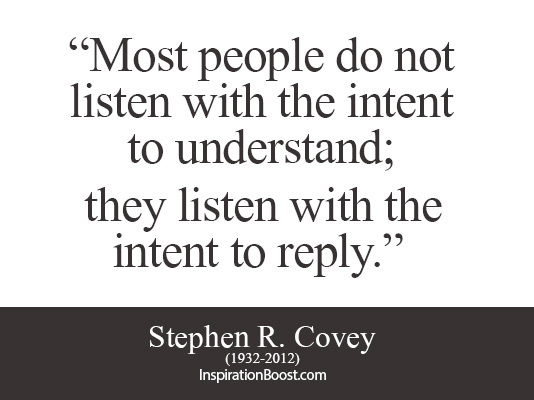 In fact, meaningful listening takes more effort and energy than speaking. Listening doesn’t just mean hearing – it means understanding where the person is coming from, what matters to them, and how they feel about a situation. It means hearing what they are saying but also perceiving their body language, tone, and passion. It takes unique abilities to listen well, and it just may be the secret to becoming a great leader. Today, consider the situations you find yourself in. When communicating with others, are you truly actively listening, or coming to the conversation with your own agenda? It’s great to maintain focus when it comes to getting what you want, but be open to understanding other people’s perspectives as well. You never know, what you thought you wanted just might not have been the best thing for you or your organization. Each of us are very different – we have different personalities, skills, and values. We all bring something different to the table. That’s why it is so important for us to acknowledge our differences, celebrate them, and bring them together. Empowering others is the key to success. Here’s a few key things to remember in empowering others. Practice humility. Before going to battle in a competition with a colleague, take a moment to think subjectively about your opponent. What qualities do they have? What skills have they acquired? What do they bring to the table that you don’t? Take your pride out of the equation. The simple fact is that the best way to work together is to enhance everyone’s strengths, no matter what. Once you do that, true success will be easy. Strike a balance. When thinking about why I’ve been successful in my career, I automatically think about other people. Whether supervisors or colleagues, my peers have truly been a huge part of my journey. I have developed a system to know when to rely on myself and when to turn to others. And that delicate balance is the key to success in the workplace. Expand your definition. Don’t take empowerment to only pertain to subordinates. You can empower your boss just as easily. No matter how confident we come across, we all have insecurities from time to time. It’s important to assure your boss that she is a valued member of the team on a regular basis. It can be lonely at the top. So often we are taught that it’s a dog eat dog world – everyone’s out for themselves, hoping for more money, influence, or power. Throw that thought away. Especially in the nonprofit sector, collaboration is key. Collaborate strategically by empowering all members of the team to bring their strengths to the table. That is when you will be truly successful. According to Wikipedia (the premier source for information these days), leadership has been described as the “process of social influence in which one person can enlist the aid and support of others in the accomplishment of a common task.” I happen to love this definition. So often when we think of leadership we think of the president, the CEO, the one in charge. But it’s so important to remember that leadership has so many more dimensions than that. Here are a few reasons I love the Wikipedia definition. No mention of being in a position of power. Leadership can happen anywhere you are – whether you’re the receptionist or the director. The key is the way you use your relationships and influence. Even as an entry level staff member you can be a leader. If you respect yourself and those around you, everyone will gravitate toward you. And with grace and poise, if you value everyone’s input as you make your own decisions, and demonstrate that you have sound judgment, you are a leader. Leadership happens outside of the workplace as well – it happens in friendships and with family members. When you take the initiative to do the right thing, you are demonstrating your leadership. The end goal is a common task. We often think of leadership on a grand scale – changing policy, mobilizing communities, and affecting change. But leadership doesn’t have to only look like that. It can also be shown in everyday life. It’s simply showing others that it’s easy to do the right thing – that will be enough to affect change. You see leadership when someone gives a stranger their seat on the bus. When someone holds the door open for someone else. It’s these small moments that make up the big picture. No mention of money. Again, leadership does not only happen when you have the ear of many (whether that’s because you have money or otherwise). It happens when you are sensitive to others and serve as a role model of how to live. That can happen on Wall Street or at the corner store. It doesn’t matter who you are or what you have – you can be a leader. This concept really helps me as I move through my career. I have not been in management positions in the workforce but I feel I have vast leadership experience, which has come from working with others and listening to what they have to say. Because a good leader does that first – listen. I had a leg up on Day 4’s exercise, because I’ve actually done something similar before. We were asked to take some time to write down everything we value, anything that we care about – at least more than 12. Then, we needed to designate from that list the ten we felt were at the top. In the previous exercise I did, I had narrowed it down to five. I did the original exercise with Deirdre Maloney; you can read about her company Momentum San Diego here. And not surprisingly, those five were on my list again (I didn’t do the exercise that long ago). But I found my additional five to be very interesting. I had to very, very selective to do the first five – but now I had the opportunity to list other parts of my life that were important. I think being a role model and connecting with others are the two that jump out to me most. Being a role model perhaps is my elaboration of leadership, leaving a legacy, and making a difference all at the same time. It’s important to me to always conduct myself in a way that others respect and love. I also value making connections – this is why my friendships and relationships with my family are so important to me – because connecting with others is an important part of my life. I encourage you to do this exercise, too! Doing the original five was so eye opening to me, and allowed me to understand the underlying motivation for everything I do. I’m aware that I’ve been citing other blogs frequently lately. I’m also aware that this next one I’m referring to was written over a week ago. But I’m writing about it anyway, because it’s that good. This was one of those think-about-it-days-later blog posts. I’m talking about 7 Lies That Undercut Your Chances of Promotion at Everyday Bright. I absolutely encourage you to take a moment to read it – it will definitely give you a new perspective on some tried and true job skills. I’d like to outline a few of my thoughts on some of the lies. I love this. We all know that one person in the office who comes in at 7:45 and leaves at 6:15. She likes to talk about how much work she has to do and how there isn’t enough time in the day. In fact, everyone in a nonprofit has more work than time to do it in. That doesn’t mean you should overwork yourself and sacrifice your personal life. After the workday is over, put your work down and go home to your family. You’ll be able to recharge your batteries and will be that much more efficient tomorrow. This one might be the one that resonates with me the most, that I personally need to work on. This relates to what I mentioned earlier as my biggest weakness – I need to step up and do projects that are outside of the box that showcase my creativity and understanding of fundraising and the nonprofit sector. I need to do more than my job – I need to prove that I can do my future job. Jennifer is emphasizing the point that you shouldn’t just network with the high ups, you should network with everyone. You never know who will become what and who has pull where. I love this point. It’s critical to be friendly and open to everyone you meet, whether it’s the receptionist or the CEO. Everything has something to offer – you just need to give them the chance to show it. I disagree with her just slightly on this one. I would modify this point to say you should have a plan (or goal), but it should be loose and ever-changing. I think there is value to having an idea of where you’d like to be in the future, but mostly to notice the aspects of the goal that are attracting you and keep them at the heart of your actions. Notice I didn’t address Lie #6: Go back to school, because clearly that’s exactly what I’m doing in two months! However, I don’t see going back to school as my ticket to promotion, instead simply something to pair with my work experience and knowledge of the sector as I navigate my way to my goal. Thank you, Jennifer, for such a wonderful post. We all can learn a little something from these points! !